DISCLAIMER: Please bear with me as I find my voice in the world of blogging and slither out of my lawyer and government manager skins. Using the technical advocate voice just isn’t as effective in reaching people’s hearts as it was testifying at the legislature, or appearing on a panel talking about utility regulation. My new life at the Foodbank led me to the dunk tank on Saturday, taking the splash a couple dozen times at the Barre Town School for Family Fun Day. 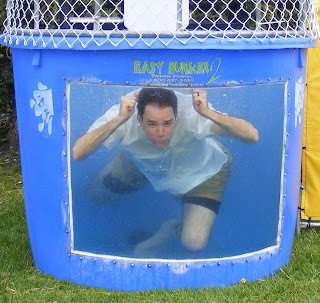 People keep commenting on what a “good sport” I am, but who could complain about having some wonderful kids dunk me in a heated tank for a good cause? The school principal followed me, and they gave him a squirt gun for protection. I guess I didn’t know enough to be scared. I am so impressed by the work of the Barre Town students who organized Family Fun Day. I will be speaking with them tonight, and I can’t wait to thank them. They are an incredible example of what can happen when a group of thoughtful, concerned, hardworking people put their minds and hearts to something. I look forward to seeing where their paths take them in the future—our community is lucky to have such a special group of kids! I followed the dunk tank up with an unveiling of the sign at the Foodbank’s Kingsbury Farm. It looks like we might have to evict a few groundhogs, but I think that spreading awareness of hunger, and its solutions, in Vermont and growing fresh, nutritious food will make all the effort worthwhile. Maybe we can sponsor a contest for the best impersonation of Bill Murray in “Caddyshack,” although I’m not sure our groundhogs are quite so clever.